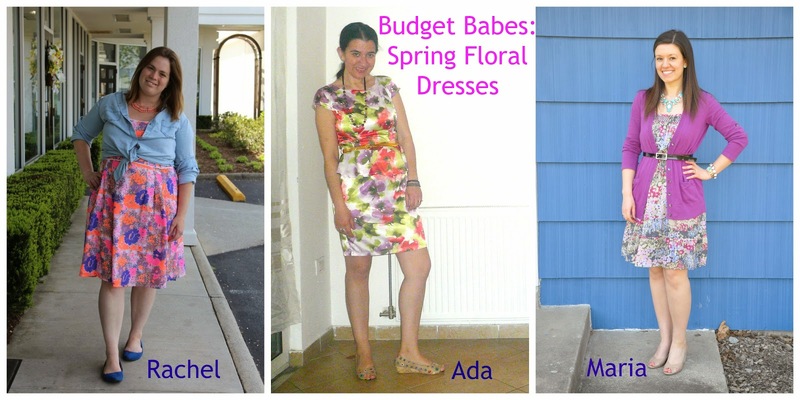 Happy Friday and welcome to the second to last edition of Spring Budget Babes with Ada and Rachel! Today's trend is all about floral dresses (but honestly, do these ever go out of style??) and the perfect way to end Ada's birthday week celebration on her blog! Don't these two ladies look lovely? Rachel and I had a similar idea of layering a piece over our dresses with some chunky necklaces for a fun pop. Ada let her floral dress be the star of the show and accompanied her dress, like I did, with a neutral peep toe. Make sure you stop by their blogs to check out their Spring looks! Extremely late in the game, but this is actually the outfit I wore on Easter Sunday over a month ago! Both the dress and cardigan came from my Old Navy working days, so they were both 25% off. I think that is the only thing I miss working there were the discounts! 25% off at Old Navy and 50% off at Gap and Banana Republic! So nice :) So needless to say, I've had both of these pieces for several years and have actually worn them together for another Easter past haha :) If something works, why fix it?? I loved, loved this outfit the moment you e-mailed the photo. That dress is beautiful and looks so expensive. The lavender cardigan and statement necklace you chose complement it perfectly. I loved that collage of ours. We all look so festive, fun, colorful and springy in our beautiful florals. And the way you worded this post is funny, because I wrote mine similarly. Great minds think alike. Thank you to you and Rachel for ending up my birthday week with a bang. I agree both yours and Rachel's looks are perfect for Birthdays, but Easter also. Have a great weekend celebrating your mother! <3 Ada. Your dress is gorgeous and I love how you styled it with the belted cardigan! Such a pretty look! Have a great weekend! Beautiful outfit! I feel like this kind of look is good for work or events like showers and holidays. It looks very put together and pretty. I love floral dresses and have about a zillion, I am definitely going to to try styling them like this! Nice to meet you, Maria! Lovely dress and look Maria! You look beautiful. I love that you got these at a good discount from Old Navy and boy what a great price for it all. Have a great weekend! I have a floral dress I got from Stitch Fix last spring and I wore it on Mother's Day last year. I have really been wanting to find different ways to wear it and I have to thank you ladies for some new inspiration. I love the color of your cardi and it works so well with your dress! I follow Rachel and Ada already, but I've never stopped by your blog, so thought I'd say hello!! This outfit is adorable, you look great! love your dress. If I work at Old Navy I would be in trouble.